With a name like “Beast”, it’s only fitting that our material comes standard in the heaviest gauge of wire mesh on the market, fully framed. 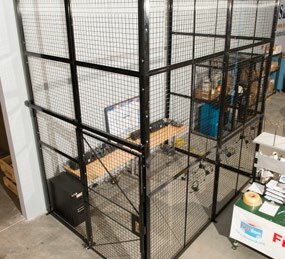 BeastWire’s unique Growth Channels and flexible panels quickly fill spaces between wire mesh and existing walls; allowing you to use standard width panels. Custom options also available, including: XL doors, automatic door closers, tapered panels, special locks, and extended heights (over 25’). 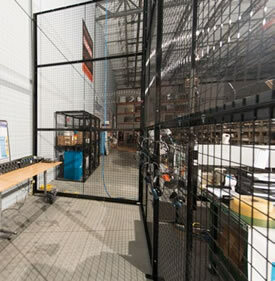 The “Beast” uses panels that stack between universal posts for a simple and secure installation. The design also uses all carriage bolt connections to assure that systems withstand the test of time. With the 3D Configurator, BeastBuilder, you can easily design wire mesh enclosures and get quotes within minutes! 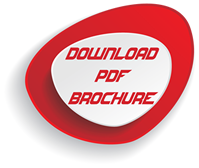 Quotes include a set of approval drawings, bill of materials, material pricing, and freight estimate. 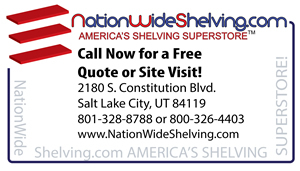 Backed by our unrivaled 10-year warranty. Safety & Security: Evolved. 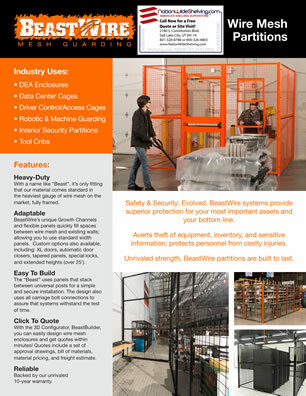 BeastWire systems provide superior protection for your most important assets and your bottom line. Averts theft of equipment, inventory, and sensitive information; protects personnel from costly injuries. Unrivaled strength, BeastWire partitions are built to last. 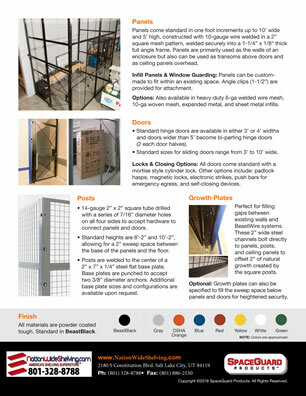 Panels come standard in one foot increments up to 10’ wide and 5’ high, constructed with 10-gauge wire welded in a 2” square mesh pattern, welded securely into a 1-1/4” x 1/8” thick full angle frame. Panels are primarily used as the walls of an enclosure but also can be used as transoms above doors and as ceiling panels overhead. Infill Panels & Window Guarding: Panels can be custom-made to fit within an existing space. Angle clips (1-1/2”) are provided for attachment. 10-ga woven mesh, expanded metal, and sheet metal infills. Standard hinge doors are available in either 3’ or 4’ widths and doors wider than 5’ become bi-parting hinge doors (2 each door halves). Standard sizes for sliding doors range from 3’ to 10’ wide. Locks & Closing Options: All doors come standard with a mortise style cylinder lock. Other options include: padlock hasps, magnetic locks, electronic strikes, push bars for emergency egress, and self-closing devices. 14-gauge 2” x 2” square tube drilled with a series of 7/16” diameter holes on all four sides to accept hardware to connect panels and doors. Standard heights are 8’-2” and 10’-2”, allowing for a 2” sweep space between the base of the panels and the floor. Posts are welded to the center of a 2” x 7” x 1/4” steel flat base plate. Base plates are punched to accept two 3/8” diameter anchors. Additional base plate sizes and configurations are available upon request. Perfect for filling gaps between existing walls and BeastWire systems. These 2” wide steel channels bolt directly to panels, posts, and ceiling panels to offset 2” of natural growth created by the square posts. 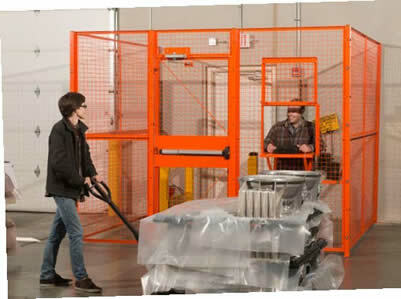 Optional: Growth plates can also be specified to fill the sweep space below panels and doors for heightened security. All materials are powder coated tough. Standard in BeastBlack. Gray, OSHA Orange, Blue, Red, Yellow, White, Green.